I am working on a library, French style a la Texas Cote. My client and I had decided to either recover and restyle her old sofa or maybe go with a newer version of a traditional, cushy one. The two armchairs hopefully are to be French antique bergere's, if not, then English saddle arm ones. Everything will be covered in linen, linen colored with pastel pink and white pillows. The dark paneled walls are going to become very light and creamy colored with an undercoat of brown barely peeking through (maybe!). 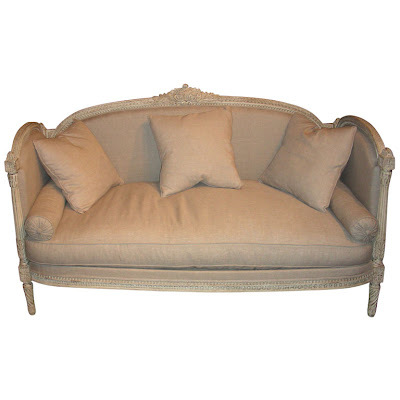 The issue is tonight my client went 1st Dibs surfing and found this French settee. We both adore it, but decide her husband would veto it immediately with comfort concerns. He loves it. 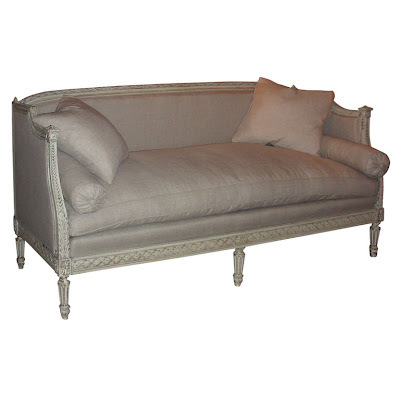 The settee is in France and is expensive. We can't test try out. Should we buy it? Would you? Or, would you buy this one from 1st Dibs, also from France?